Me and My Pink Mixer: Compost Cookies & Happy Earth Day! Compost Cookies & Happy Earth Day! This is a really long post for me, but stay with me, because the end result is amazing! A couple of months ago, when my daughter was out of school for one of our snow storms, she watched an episode of Regis and Kelly. One of their guests was Christina Tosi, a famous pastry chef from some place in New York City called Momofuku's Milk Bar. Well, I guess this cookie became so famous that even Regis and Kelly wanted in on the action, so they asked Christina to come on the show and make the cookies. This cookie is filled with the most unexpected flavors (potato chips, fritos, rice krispies, chocolate, etc), but somehow it all works to create a fabulous cookie! Anyway, my daughter was so impressed and intrigued with this cookie that she printed the recipe from the Regis and Kelly website and asked me to please make them sometime. Since last night was the eve of Earth Day and I wanted to help keep our planet clean by cleaning off my kitchen counter of all the snack foods lying around, I decided to make Compost Cookies. I used pretzels and cheddar gold fish crackers for the snack foods and chocolate chips, Reese Pieces, and M & M's for the baking ingredients. I should have read the recipe before I began making them, because I didn't notice until I had them all mixed up that you need to refrigerate the scooped cookie dough at least an hour before you bake them. This is a very important step and I didn't want to mess them up, so I did. A few minutes later, I glanced at the calendar on my fridge and noticed that I was supposed to be at a Swim Team Board meeting about ten minutes ago, so I ran out the door and went to my meeting. I got home about two hours later and then baked the cookies. They turned out perfectly and oh my were they good! I ate three and this was about 9:30 at night! My daughter loved them too and took a bag of them to school today. Hopefully those teenagers will eat them all and I won't have any left this evening, because I would not even want to know how many Weight Watcher points are in one of them! On a lower speed, add eggs and vanilla to incorporate, increasing mixing speed to medium-high and start a timer for 10 minutes. During this time the sugar granules will fully dissolve, the mixture will become an almost pale white color and your creamed mixture will double in size. When time is up, on a lower speed, add the flour, baking powder, baking soda and salt. Mix 45-60 seconds just until your dough comes together and all remnants of dry ingredients have incorporated. Do not walk away from your mixer during this time or you will risk over mixing the dough. Scrape down the sides of the mixing bowl with a spatula. On the same low speed, add in the hodgepodge of your favorite baking ingredients and mix for 30-45 seconds until they evenly mix into the dough. Add your favorite snack foods last, paddling again on low speed until they are just incorporated. Using a 6 oz. ice cream scoop, portion cookie dough onto parchment lined pans. Wrap scooped cookie dough lightly with plastic wrap and refrigerate for a minimum of 1 hour or up to 1 week. DO NOT BAKE your cookies from room temperature or they will not hold their shape! When the oven reads 400 degrees, arrange your chilled cookie dough balls on parchment or silpat-lined baking sheets a minimum of 4 inches apart in any direction. Enjoy the sweet and salty goodness! How crazy all those snacks combined into one cookie could turn out so well! I am a little intrigued and might have to try these out now. Love it! Sweet and salty is a good time, the Goldfish especially are a great touch. I definitely like the idea of salty and sweet cookies. As long as there are not nuts, everything sounds good in these cookies. That sounds like a lot of fun to make. I think I may do this with my kiddies this weekend! I wanted to let you know that first, I love your site & your name! WOW, who'da thunk it? I think I just might need to try these out. Thank you for sharing. I am visiting through you link at I'm Lovin'It. Oh WOW! those sound over the top good!! Thanks for linking up to I'm Lovin' It! Have a GREAT weekend! The goldfish sounded awful at first but once I thought about it I bet its incredible!!! I'm going to have to try this! I’m your latest Friday Follower! I would appreciate a follow-back on Google Friends Connect and/or Networked Blogs. Oh my this sounds like an interesting recipe. I'm almost too afriad to try them. Oh what should I do? YOu said they were scrumptious. Thus I will take your word for it. I will write down this recipe and put it in my box for when I'm feeling quite brave. Thanks for sharing it with us. These cookies actually sound amazing. the more salty foods the better. Fritos in cookies???? Ahhh heaven! Loooove salty and sweet! I know my kiddos would looove these! 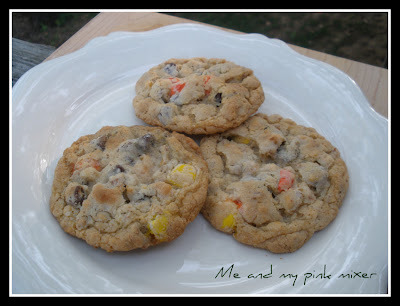 .....I haven't had "Minnie"...my pink mixer spinning in a while....maybe I'll try them this weekend...thanks for sharing!